Tinsley Ellis has really hit his stride since he began recording for his own Heartfixer Music label. The Georgia-born guitarist has produced quality recordings since the mid �80s, but his last three releases, the 2013 all-instrumental Get It. and 2014�s fine Midnight Blue were his best overall releases over his long career. However, Ellis tops both of those with his latest release, Tough Love. Ellis� guitar work has always been his strong suit, but with this new release, he adds what may be his best vocal performance and some of his best songwriting, penning all ten songs. He moves easily through several different variations of the blues, from the soulful minor key blues tracks like �Seven Years� and �All In The Name of Love,� to the blues rock of �Midnight Ride,� to funky blues with �Hard Work,� to country-styled Americana sounds (�Give It Away�). There�s also �Should I Have Lied,� a powerful ballad with some of Ellis� best fretwork, and the haunting and intense �The King Must Die.� Ellis even picks up the harmonica for the swinging �Everything,� and plays Wurlitzer piano on the closing track, �In From The Cold,� an amazing slow blues burner. Ellis, who also produced the disc, gets able assistance from Kevin McKendree, whose keyboards are a highlight throughout, bassist Steve Mackey, drummer Lynn Williams, and Jim Hoke (sax) and Steve Herrman (trumpet) for one track. 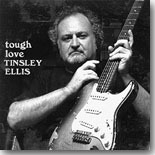 I�ve followed Tinsley Ellis since his earliest recordings for Alligator, and he�s never sounded better than on Tough Love. Maybe the freedom allowed by releasing his own music on his own label has freed him up to play what he wants the way he wants�.I don�t know the reason, but I do know that I like it, and so should any blues fan.